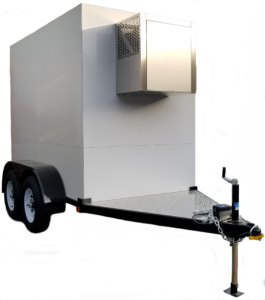 Thanks to its 3" of thick, foamed in place CFC-free polyurethane insulation, this Polar Temp 4X8AD refrigerated ice transport ensures your ice stays ice cold while making deliveries or transporting orders to special events. Its front mounted forced air refrigeration system helps maintain proper cabinet temperatures. An auto-defrost function allows for minimal maintenance and upkeep. The 140 cubic foot Polar Temp 4X8AD refrigerated ice transport also features reinforced truck-type hinges, a lockable door latch, and a heavy gauge "Tread-Brite" floor plate for added durability. A heavy-duty white polyester finish protects the Polar Temp 4X8AD refrigerated ice transport against years of abuse under the harshest conditions.